A Lychas asper female from Tanzania. Photo: Jan Ove Rein (C). 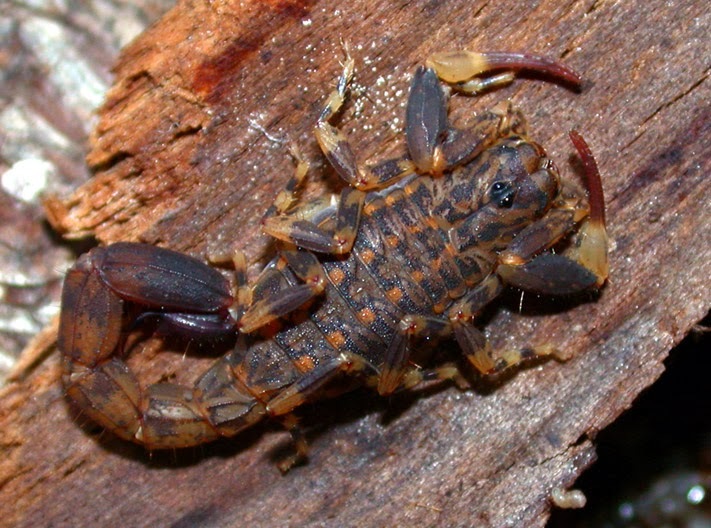 Another report from Kovarik & Ojanguren Affilastro's new book Illustrated Catalog of Scorpions, Part II. Bothriuridae; Chaerilidae; Buthidae I., genera Compsobuthus, Hottentotta, Isometrus, Lychas and Sassanidotus. The fifth blog post from the book sums up the the news concerning the genus Lychas C. L. Koch, 1845 (Buthidae). Lychas kaimana Lourenco, 2011 is declared nomen dubium. Lychas aberlenci Lourenco, 2013 is not mentioned in Kovarik's review. It is possible that this species was published after the manuscript for the book was finished or that Kovarik got it too late to include it into the text. The chapter on Lychas has a section on observations on captive specimens in the genus. An identification key for the genus is provided. Kovarik F. Family Buthidae. In: Kovarik F, Ojanguren Affilastro AA, editors. Illustrated catalogue of scorpions Part II Bothriuridae: Buthidae I, genera Compsobuthus, Hottentotta, Isometrus, Lychas and Sassanidotus. Prague: Clarion Productions; 2013. p. 145-212.